Go Green without compromising performance. Live Clean is a unique eco-friendly beauty care line that delivers exceptional results using natural, plant based ingredients. Live Clean formulations are made with a minimum of 96% replenishable, renewable and sustainable plant ingredients...as good for the earth as they are for your body. Live Clean Green Earth Invigorating Body Wash is infused with certified organic botanicals of Lavender and Eucalyptus to stimulate senses while gently cleansing. Smells great. Arrived on time. It's a soft texture on the skin. Not too thick like some body washes. I would definitely purchase again. This is my favorite body wash. I have tried 4 of the different smells of Live Clean body washes and enjoyed them all. They are all moisturizing, foamy and leave you feeling clean. My husband and I both enjoy the Green Earth smell. We are on our third bottle and I will continue buying. If you are looking for a clean, plant-based, wonderful body wash, buy this (or any of the other varieties, whichever sent you prefer). Iâ€™ve used this for a while and love it. I like that itâ€™s more natural, texture and smell are great! Ordered this for the first time without knowing about the scent, but tried it because I love Live Clean baby products. Very happy with it, smells great! Love this product. Less harsh than regular soap. Get it when on special, as it is pretty much the same price as at the store. I love all Live Clean products. The body washes work so well. I love the fact that whatever Live Clean product you use, you only need to pour a small amount and it works so well. A Canadian, natural and cruelty free company. Can't ask for anything better! Great value for the money. Just a little goes a long way and I find it doesn't dry my skin like other's I have used. Only wish it came in a vanilla scent. I have been searching for the perfect body wash for years. LOOK NO FURTHER! This stuff is amazing. LUXURIOUS! It leathers us wonderfully, smells amazing and leaves me feeling clean and moisturized all day. Great product. He uses it, along with Anthony Pre Shave Oil to shave his head. Great product. Love the Live Clean line overall (body wash, shampoo, baby products). This odywash smells great (wish it would last a bit linger on me;) love knowing I am not putting chemicals on my body everyday - love that its 97% natural - adore that it does not leave film in bottom pf tub/shower. Will try other scents! Love the smell, every time I enter into the bathroom after recently showering it smells super fresh and pleasant. I've had compliments on the smell of it too! Feels great, and doesn't get really slippery or coat the tub. love the smell ,and a nice sized bottle. I like how they don't use microbeads but still get a nice soapy wash. I really like this line of products. I am starting to only use the Live Clean line. This body wash is gentle, smells nice and leaves no sticky feel. I only use Live Clean body wash. I love the scent of all the washes and I never feel a soapy residue after using them. Great value for your money too! Awesome product. It lathers well, only a small quantity is necessary, and a great fragrance! My husband likes it too! There isn't a Live Clean product that I don't like so far. This body wash smells amazing and makes me feel great! One of the best natural body washes I have ever used. Smells awesome and the lather is really rich which makes it last a long time. Will definitely buy again!!! Smells great, lathers great and cleans great! Better for you and the enviroment! A fantastic product! 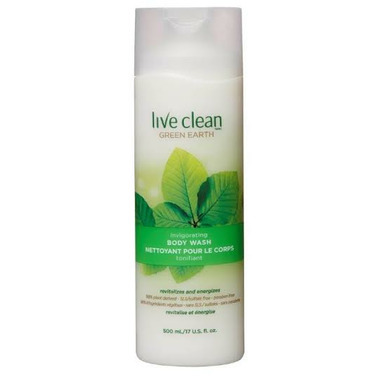 I love the live clean body washes, I have tried them all. It's great to know that I can use these on my little ones, and not have to worry about harsh chemicals. They lather great, you feel really clean, and your skin is happy too! LOVE this product. Won't use any other body wash now. It leaves my skin feeling clean and fresh with no added residue or unwanted scent. Just pure and clean. Good scent, lather and very happy over-all with it. Also glad it is made in Canada. Great fresh scent with a good lather for a natural product. Rinses off well and leaves your skin feeling squeeky clean - for that reason probably not the best for someone with very dry skin. I choose it because it said that it contains Eucalyptus which I love but the smell of this body wash stink. I am rating it 1 because it makes your skin soft, but the smell is unpleasant. We love this product. I first started buying Live Clean products to find something to use on our son, without all those chemicals. It smells great, and has a good lather. Makes us feel clean! I live in a rural area and it is difficult to find the Live Clean body wash in our area, so I am so glad I found a great online source. this is a great product with great scent and fantastic cleansing power and its Natural, I love it. Unfortunately they dont sell it in US but I always order it from this website and they ship it to me in 1 week. I don't care for the smell, but it's one of the few that is gluten free. My daughters and I love these products especially anything with argan oil in it very good for the hair and skin!! What a wonderful scent and it is eco-friendly too! Gentle product - I really love it and will definetly give it a thumbs up! Lathers nicely too! This is BY FAR, my favourite body wash. I use it daily and have for a couple years now. Not only is it Eco-friendly but also great on my skin. My husband loves it too! This smells so great! It's a pleasure to use. My only complaint is I find it slightly drying on my (very) sensitive skin. One of my favourites. refreshing and not a lot of chemicals. Product lathers up very nicely. Says it contains lavender & eucalyptus, but to me it smells like cherry-flavoured gum. It's not unpleasant, but not what I would expect 'Green Earth' to smell like. Price is great, especially for an eco-friendly product. Great, invigorating fragrance - I'm finding most of Live Clean's products smell very similar, aside from the Apple Cider Vinegar shampoo. Fine by me, I have loved all of the scents so far. Gentle, non-irritating and non-drying. Love it!